Just as the world is celebrating the International Year of the Lung, the Philippine Tuberculosis Society, Inc. (PTSI) is likewise celebrating its 100th year of anti-TB service to the Filipino people. Founded in July 29, 1910, the PTSI is a non-stock, non-profit, private organization with a mission to help in the prevention, management and control of tuberculosis in the country. Throughout its century of service, the PTSI strove in its commitment to assist the government in its National TB Control Program. Its hospital arm, the ,Quezon Institute, continues to serve mostly indigent patients afflicted with TB or other related lung ailments. Along the way, the Society established its own historical milestones, such as the use of Directly Observed Treatment Short Course (DOTS), which was pioneered by the Quezon Institute, in the private sector as a form of TB management and care. PTSI's centennial celebration was launched by its "2010 Dinner-Dance", a fund raising event which was held last April 29, 2010 at Club Filipino, Greenhills, San Juan City. A brand new car was given away as grand prize for the raffle event. On July 29 2010, a Centennial Program will be held at 10:00 A.M. at the Dona Julia Vargas de Ortigas Hall, PTSI building in QI Compound, Quezon City. This will be preceded by a thanksgiving mass, afterwhich various activities have been lined up to commemorate this special day. The invited guest speaker to the event is Mayor Herbert Bautista of Quezon City. 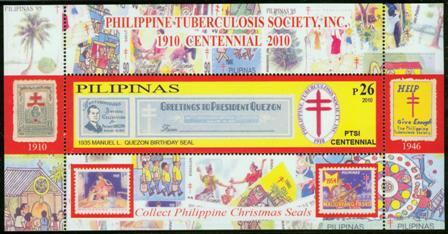 On August 17, 2010 at 12 noon, there will be a joint launching ceremony of the PTSI Centennial Commemorative Stamps and the 2010 TB Seal Campaign at the Podium, Ortigas Center, Pasig City. Plaques of Appreciation will be given to the Philippine Postal Corporation, the TB seal volunteers, philatelists and artists, and to SM's Henry Sy for their continuous support of the Society's TB campaign. After a century of service, PTSI has undergone radical changes, adapting itself to the call of the times. Through the years it has remained steadfast to the Society's motto ""Serbisyong Publiko, Serbisyong may Puso" ("Public Service With a Heart"). As TB is still the 6th leading killer disease in the country today, the Society's mission is far from over. As it faces yet another new century of service, it urges its partners and affiliates and its fellow Filipinos to continue the fight towards the goal of a TB-free Philippines.